Ross Cohen is the President of Triumph Dining, a website, blog, and newsletter for the celiac and gluten-free world. 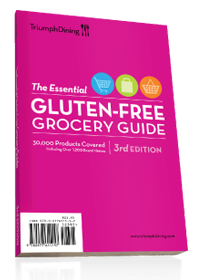 Family-owned and run by five happy gluten-free dieters, it has released its third edition of The Essential Gluten-Free Grocery Guide with the latest research of 30,000 products including 1,100 brand names. The book uses 5 symbols for our ease in determining which products satisfies one’s individual needs in purchasing grocery items in a store or online. I have not come upon such an extensive list of items in any book I’ve had in my hands or researched online. The availability of items in this 3rd edition far outweighs the availability in the previous edition, and the shopping tips and overview of new food labeling laws are invaluable in themselves. The addition of their honest in “limitations of the Guide itself” only shows Triumph Dining’s dedication to providing a service with nothing but one’s health and service in mind. The grocery guide is updated yearly and according to Ross they are currently the largest independent gluten-free publisher in North America. This resource book is given a thumbs up and is HIGHLY recommended by me.